Well, d-day has almost arrived. Tomorrow I head back to school. Where did the summer go? At least the class schedule is looking pretty light and I'll only be at school for 2- 2 1/2 days a week. Today I want to share a really simple technique/pattern I've called "String Rose". This idea first made an appearance on the blog during the old into new challenge back in 2014. I named one of the experimentation tiles as Trentwith and though this pattern was the initial source of inspiration, my version takes a different approach. I had always meant to share the technique as it's so simple, and fun, but I just didn't get around to it. Until now! 2 1/2 years later.....haha. 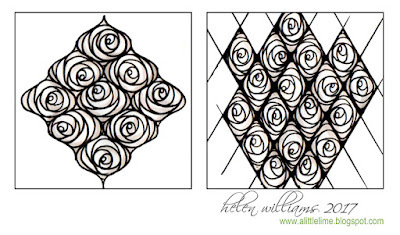 The String Rose Pattern - this shows the base technique. I've never linked my Instagram video before so I hope it works - not sure whether it will show up via email, so if not, just visit the website, or my instagram feed. 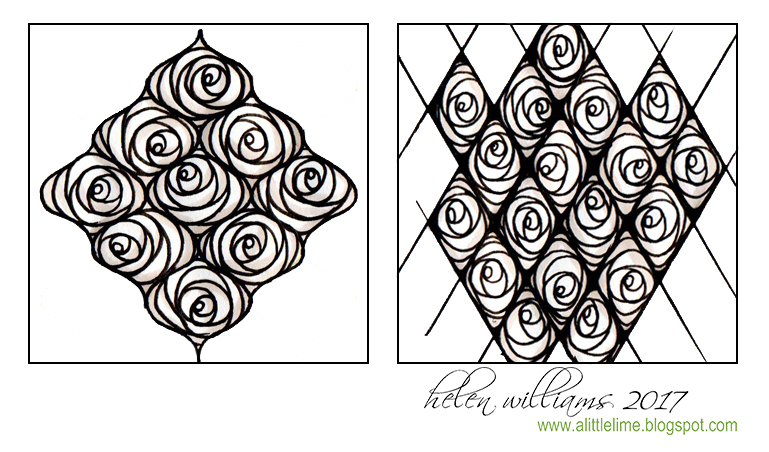 Why not try String Rose out on different grids? Shown here on a s-grid (alternating) and a diamond grid. The s-grid is my favourite. Adds to the organic feel, I think. You don't need to be locked into a grid to draw this. Freehand some random sized roses, add a few leaves. Ta da. Bouquet! Lovely. This makes a wonderful pattern. I will definitely play with this one. Great success in the upcoming school term! 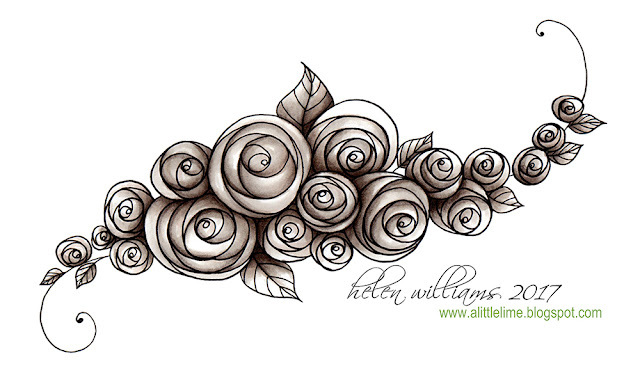 Helen, you are such an astute observer of nature, your 'string rose' actually does look like a rose. Mine, however, looks more like some kind of Dorothy-esque Kansas tornado! Thank you for sharing your talent and inspiration. I'm sure you'll enjoy being back in school! So simple but looks so stunning. Love the shading on the last example. Have fun in school. When I looked at the images my first impression was, OK - no problem. 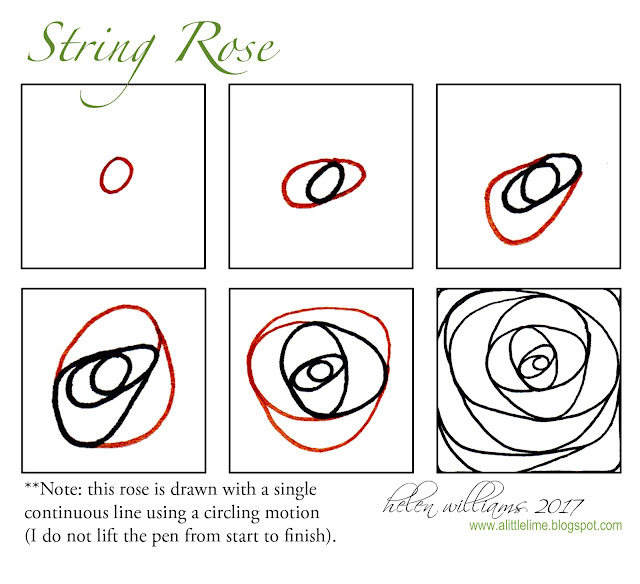 Then I watched the video...Ouch, never ever will I be able to draw your string rose in just ONE STRING, but now I know why it's called 'string rose'. (Practice, Susie, practice, practice!!!). Thanks Helen, for this challenging but so beautiful 'string'. This is a beautiful pattern and I will definitely try it and the video will help a lot. Looks as it will help if your rock a bit from side to side :) Love your work! Thank you. This is lovely! Helen! I love it! Very Charles Rene Macintosh-esque. Also, a question...I'm not sure what you meant by "alternating S-grid." Did you change the direction in which you drew the spiral with each rose? Oh WOW Helen, what a wonderful pattern. After a much-too-long hiatus from drawing, I've started drawing on some river rocks again. Reckon I'll have to discover how your String Rose will work there. Thanks, as always, for your INSPIRATION and, of course, beautiful patterns and drawings. Love this pattern. It will take a bit of practice. Thanks for sharing. As always, I'm a big fan of your work. Very pretty. I love all of your flower tangles! This one enchanted me right away. Mine don't look as balanced as yours, but they still turn out looking so interesting. I'll play with this a lot, I'm sure! Helen! This is beauuuutiful and the Instagram Video link worked wonderfully-->THANK YOU for sharing sooo much with us! Good Luck as you go back to school (heading that way myself after decades of being out!). Thanks for this beautiful Rose lesson Helen. It is still winter in the Netherlands, so a bit of roseflowers we can use now. The spring is arriving soon, can't wait ! Hope the fire is gone in your arear and your doing well.